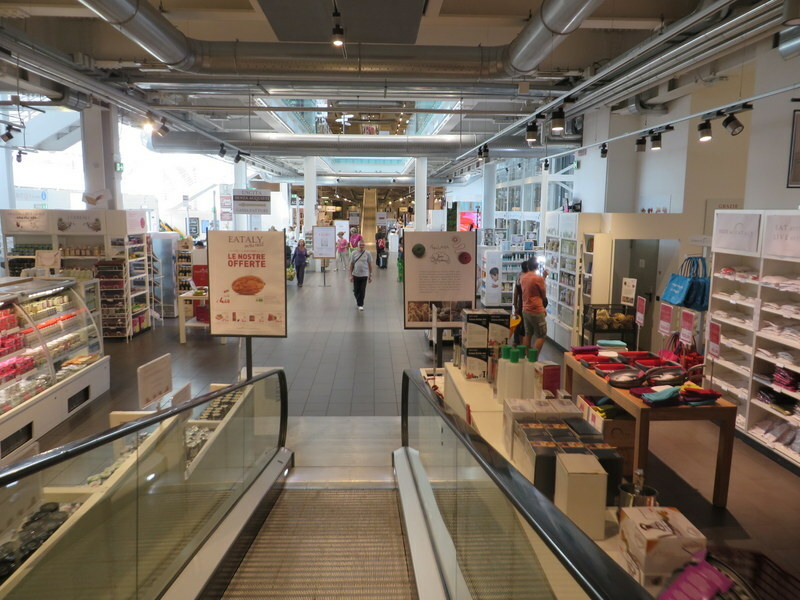 Eataly is not on the itinerary of many who visit Roma. If you only have a few days in the city, trekking out to this distant-from-the-center-grocery-store-on-steroids is probably not how you want to spend a precious vacation day. We, however, are always on the prowl for a good field trip. (No permission slips required.) So one day this week, remembering a nice lunch we had there sometime ago, we made our fourth trip there in 3 years. No, we don’t go there often. 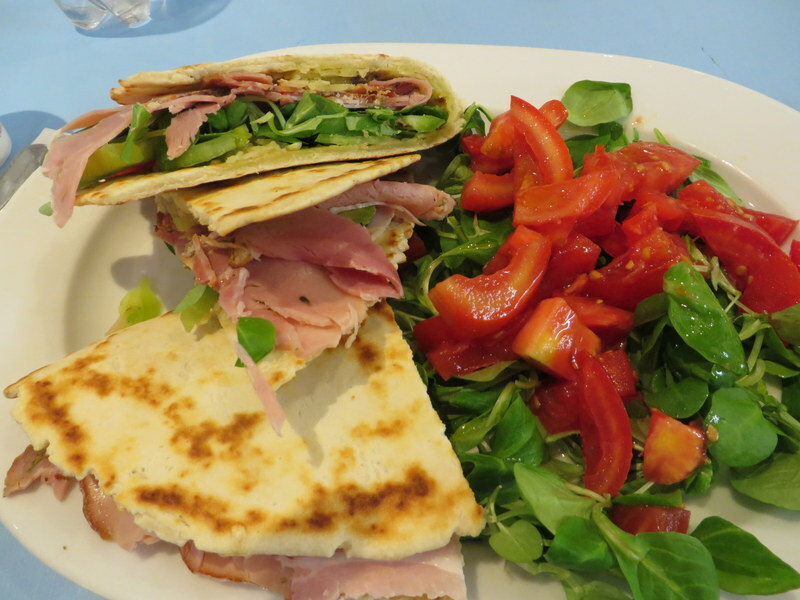 My lunch, Piadina “La Saporita” from La Piadina. True to its name, it was flavorful. Eataly, to me, is not a place to do the regular shopping (for one thing it is a long way from home), although around lunch time, it gets busy with Italians who are snapping up the fresh produce and other delectables. To me, it is entertainment. Meters and meters of pastas, in shapes I have never seen accompanied by colorful produce, prime meats, abundant fish, hanging prosciutto and salumi of every kind, endless cookbooks, kitchen implements for which the use is obscure, row-upon-row of wine, a rainbow of preserved vegetables, a chocolate selection to make the Swiss jealous, and several interesting eateries. It is four floors of decadence. It is expensive. Everything sold there is Made in Italy. Bravo! The produce area is almost unreal in its beauty and bounty. All Italian in season, of course. Tucked behind Stazione Ostiense, it can be difficult to find when arriving by Metro. The first few times we thought we should leave a breadcrumb trail as we traipsed through tunnel-after-tunnel. This time we noticed prominent signage that guided us. It was excellent, we thought. Perfect help for tourists: giant signs and arrows everywhere…until the last couple of turns where clearly the direction givers assumed “You can’t miss it.” (This happens a lot in Italy: assumptions on way-finding.) The final leg has you traverse the entire under-track corridor at Stazione Ostiense on the hope that at the end one might emerge near the entrance to Eataly. If you decide to go, persevere. Conservanti included these gorgeous peppers. 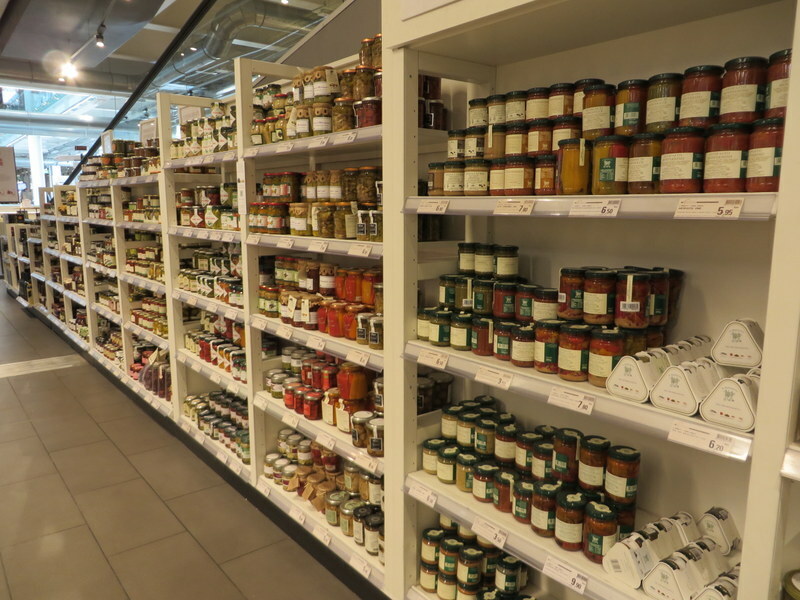 There’s a new Eataly in Piazza della Repubblica. (They took over an old MacDonald’s. Quite the change.) We have not visited yet, but certainly it is more central for most visitors. We’ll make that a future field trip. This trip, we had a nice look around, and a fine lunch, but we did not buy much: an olive-pitter and some pretty orangey-yellow Moleskin notebooks, which I love for note-taking on trips. 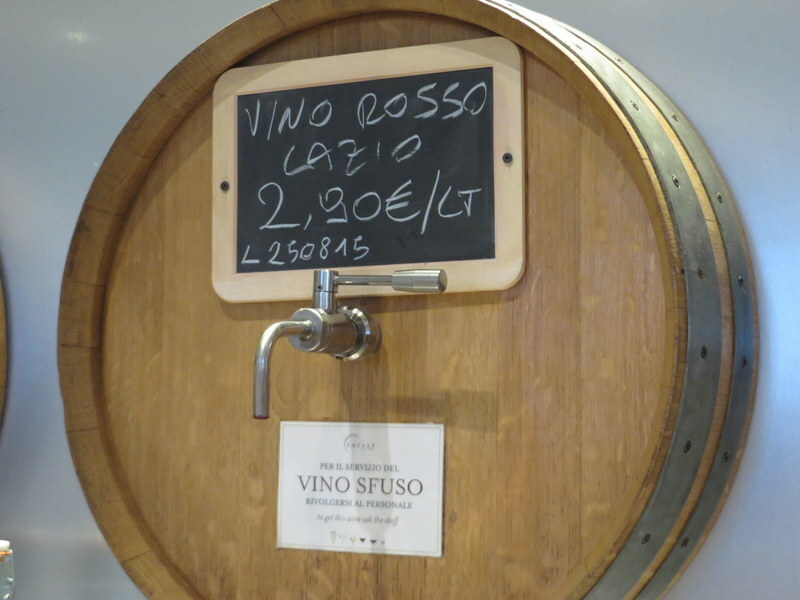 Vino sfuso at a very good price. They even sell empty bottles in case you forgot yours. The food outlets are called “Ristorantini” or little restaurants. They are semi-self-serve but food is made-to-order. This one, empty at noon, because lunch here really does not start until 13:00. Long, long shelves of almost everything. 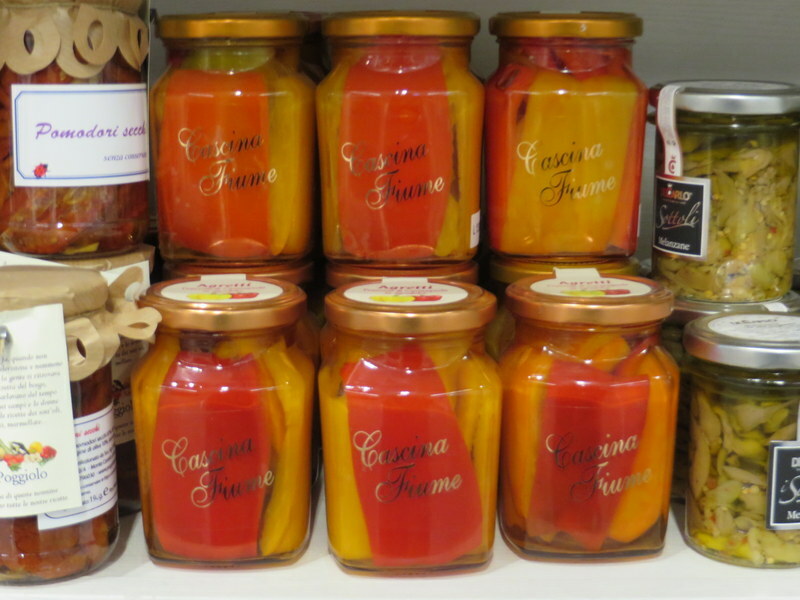 Here, preserved vegetables. Not your Green Giant corn…. Riding the moving ramp down. This is a huge place, built in what was an abandoned air terminal. 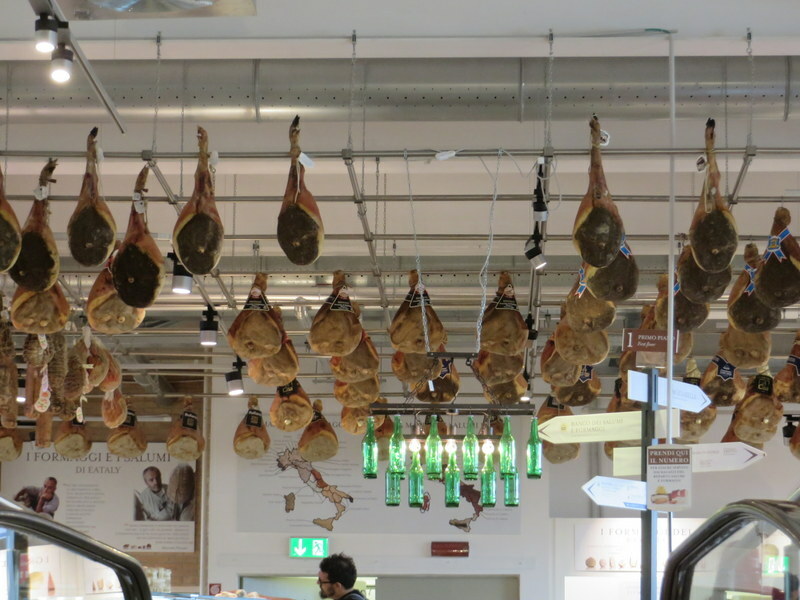 Prosciutti hang from the ceiling at the top of a moving ramp leading to the salumi department. Your blog makes me smile Laurel………….I WILL get over there next year! Enjoy your weekend! Enjoyed your article. We found an Eataly in Florence. 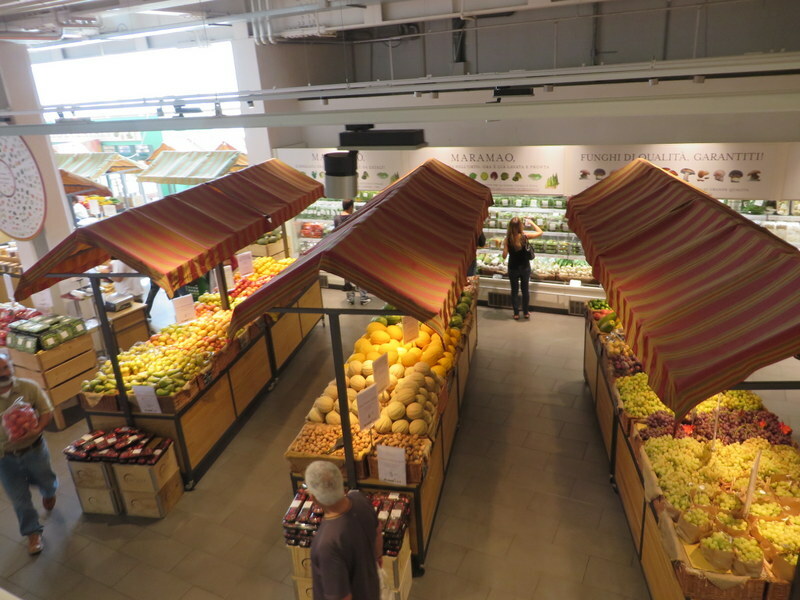 It is located inside the Centrale Mercato on the second floor. Fabulous place. And you say there are Eataly stores in the U.S.? Yes! Chicago and New York! I want to go there! It does sound like pure entertainment and heaven. That new one intriguing to take over a fast food location. I’m so glad you posted the tidbit. I keep saying, you have to come over here, Marcia! Happy you liked the piece. We are really looking forward to seeing Kim! Wow…I had no idea there was such a thing and we were near a couple of times. My kind of browse but not so sure it would be Chuck’s! I’ll remember this for our next trip to Rome. I went to their website (since there isn’t one in Seattle….or Portland) and signed up for their newsletter. I bet I could spend days there just browsing….or as I heard on a Rick Steves show…I think in France “window licking” which is exactly what it would be in this place. I love that phrase in French! So apt! I wish we had gotten out here when we were in Roma…next time! It reminds me of a larger version of La Grande Epicerie in Paris. I love to hang out in these places. Next visit, Maarja. Next visit! Loved reading about your visit to Eataly as i was curious how it compared to the ones in States. Thanks for the update that there’s a new one more central to the city — that means I’ll be able to check it out on my next trip! 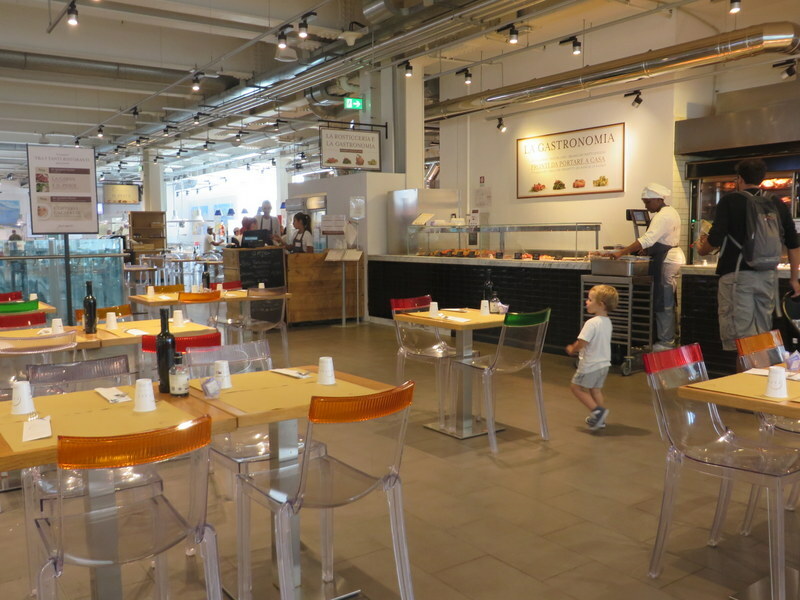 Interestingly, we have not been to Eataly in the U.S. Someday….